Curbside recycling in Framingham is weekly, on the same day as regular trash picked is scheduled. To find out what day your trash and recycle bin will be picked up, use our alphabetic street listing of Trash Pickup Days. The Town provides wheeled recycling carts designed specifically for "single stream recycling", (opposed to the older system when materials needed to be sorted). Now all recyclables can be placed in the cart. Sorting is no longer necessary. What Can or Can't Be Put in Cart to Be Recycled? Carts are emptied using mechanical arm on recycling trucks. Leave cart 4' - 5' from any parked cars or recycling truck may not be able to empty cart. Cut cardboard into pieces small enough so they don't get stuck preventing cart from being emptied. Flatten boxes, cans and plastic containers to maximize use of cart. Be sure to leave cart at curb with arrow on lid pointing toward street. As of July 1, 2011, curbside recycling is done by automated trucks which pick up container with a mechanical arm. This makes it more important that container is facing proper direction, (with arrow on lid pointing toward street), and with enough room on from parked cars or other obstructions. 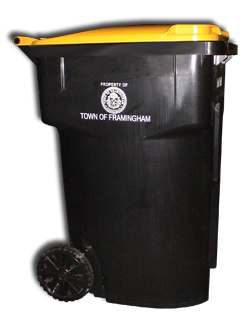 The municipal recycling program in the Town of Framingham is administered by the Department of Public Works, Solid Waste Division, (508)-532-6001. Curbside recycling is contracted to and performed by Waste Management, Inc., (800) 972-4545. For additional information contact the Town of Framingham Recycling Coordinator by sending email to: recycling@framinghamMa.gov. FREE COMPUTER & ELECTRONIC RECYCLING! PCExchange, (located in the Saxonville mill), recycles computers and many other types other electronics FREE of charge! (NOTE: charges may apply for television sets and CRT type computer monitors). Call or email to make arrangements to drop-off a single old computer -- or arrange to have a truckload of outdated electronics picked up, (also FREE). Drop-off is during normal business hours, (Monday - Friday, 8:00AM to 5:00PM). Pickup may be available in Framingham and surrounding towns. Note: When PCExchange recycles computers or other electronics which contain personal data, all data is destroyed, (again, for FREE), and equipment is recycled using environmentally friendly "green" processes which are RFPA, HIPAA, and FMA / GLB compliant! The Town of Framingham does not accept construction debris in the curbside trash or recycling programs, and does not accept it at the Town's recycling center. Framingham residents have several options to dispose of construction debris. Conigliaro Industries accepts all types and amounts construction and demolition debris including lumber, pallets, metal duct work, flashing, HVAC units, steel beams, PVC and rubber products, polystyrene, shingles and other roofing material, carpet, wallboard, ceiling tiles, fluorescent lights, cardboard and other sheet and roll goods. Also accepts wood and metal office furnishings, paper products, mattresses, all types of foam, plastic, glass and many other materials. Many items require a fee to dump. Open Monday through Friday, 7:00AM to 4:30PM for receiving. Contact Conigliaro directly for pricing and additional information. Marlboro Transfer Station, (also known as "Post Road Transfer & Recovery" or simply "PRTR"), accepts construction and demolition debris, household trash and other solid waste. Open Monday through Friday 7:00AM to 5:00PM. Call ahead for pricing and any special requirements for the type of material you need to dispose of. The Town of Framingham does not accept styrofoam in the town's municipal curbside recycling program. Luckily, ReFoamIt, LLC, operated by Framingham residents Dave and Barbara Sherman holds frequent styrofoam collections in conjunction with Grace Church, (check their website calendar for collection dates and locations). ReFoamIt will take any styrofoam that has the recycling symbol 6 in a triangle with the letters "PS" beneath it. (The "PS" stands for polystyrene, a thermoplastic made from benzene and erethylene). Recyclable materials collected include: white styrofoam insulation sheets, packing blocks, packing peanuts, (ones that "snap", not the flexible type), non-biodegrable produce and meat packaging trays, take-out food containers, hot drink cups, (check code -- Dunkin Donuts, HoneyDew Donuts #6 are ok, Starbucks, McDonalds and some other brands are cardboard infused polystyrene). ReFoamIt also collects plastic utensils, (must be separated from styrofoam). ReFoamIt does not accept bubble wrap, soft foam, bio-degradable produce and meat trays, (e.g. "GenPak" without the recycling symbol), biodegradable packing peanuts, corn based products, blue or pink styrofoam insulation sheets. The Town of Framingham does accept some scrap metal, but you may get paid for the metal from other area recyclers. Metals recycling company located on Rt. 135 in Downtown Framingham. Pays for copper, brass, stainless steel, aluminum, lead, light iron, cast iron, radiators, electric motors, electric and communication wire, nickel, and all exotic metals.